If you’ve got big plans to get in shape in 2019, this fitness challenge is totally for you. Not only will you get exclusive access to five of Boston’s best fitness studios, you’ll also get rewarded for visiting each one with free fitness classes. The challenge is called the Boston Fitness Resolution Rumble, and this is how it works: Starting January 1, each participant will receive a punch card to complete five classes at five participating studios in three weeks. Once all five studios have been punched, you turn the card in and one winner will be chosen to receive the Resolution class starter pack, which includes 25 free classes, or five classes from each studio. It certainly leaves you with no excuse not to crush some fitness goals in the new year. There is no cost to join the challenge, but participants will need to pay the drop-in rate for the studio. 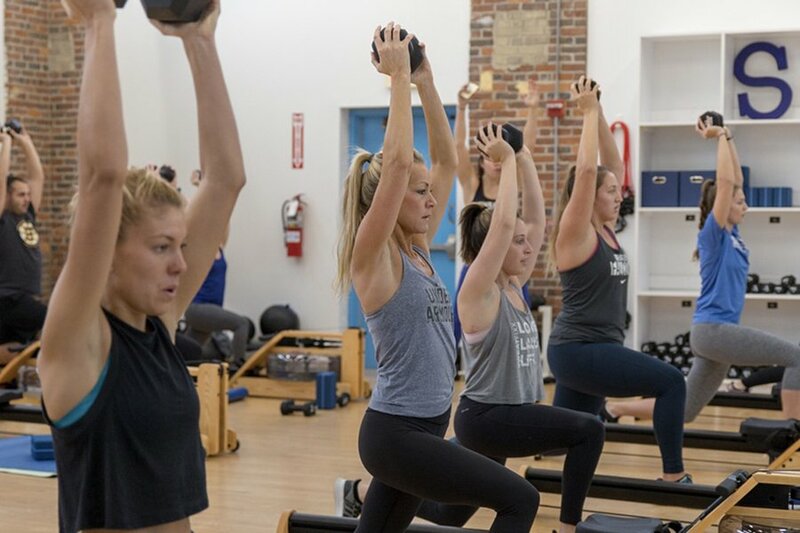 Sweat Fixx: With locations in Wakefield, Arlington, and a new pop-up space in the Gold’s Gym in Southie, this rowing-based circuit workout is tough, but also a lot of fun. The water-based rowers utilized in class allow you to feel like you’re actually on the water and they make it easier to get your form down correctly. Classes range from cardio to strength and there’s also a yoga-based option. Multiple locations, sweatfixx.com. Turnstyle: Spin classes at this no-frills studio are categorized by what type of jams will be playing as you pedal. Shoe rentals are offered and as an added bonus the space does bootcamp classes off the bike as well. Multiple locations, turnstyle.com. B-Tone: This method of reformer-style class blends Pilates, barre, and yoga concepts to create a flexible and engaging workout for everyone. Each 45 minute class incorporates a wide range of slow, thoughtful exercises to ensure you leave worked. Multiple locations, btonefitness.com. MyStryde: As the city’s first dedicated running studio, the classes at MyStryde’s boutique North End location are similar to most spin programs, with music and mood lighting to keep you focused throughout a series of running intervals. Classes are open to students of all levels. 456 Hanover St., Boston, mystryde.com. YogaWorks: This studio is pretty much a catch-all for yogis, in that it offers a little bit of everything. Need something a little slower and more restorative? Or how about a fast-paced hip-hop flow? Choose from a multitude of classes and find what works best for you. Mutliple locations, yogaworks.com.